Scurry from Mac Smith was a title that caught my eye over on Kickstarter but the wow factor of the images floating around social media & on the campaign itself were more than enough to convince me to back it. The story opens with what feels like a simple tale of mice trying to survive as central hero Wix continues another hunt for food and while the sparse & deserted village don’t offer them anything substantial to take back to their group we get a glimpse at the typical threats that mice face – cats. Things are much more complex than that though as we introduced to the expected predator/prey dynamic but behind that is a much more unique hierarchy within the group of mice themselves. It feels almost like political factions as the personalities clash with their own ideas and their own loyalties and before you can say “get me some cheese” the world outside the village explodes with its possibilities as the group are forced to hit the road. The first book does a phenomenal job at opening our eyes to a brand new world and bit by bit the complexities are a natural progression that hits us with all the risks you’d expect when it’s a question of survival. The journey outside of the village sees the potential attackers broaden and the to & fro between all the groups involved becomes a finely balance thread of plots for Mac to manage but he does it with an impressive ease. The quest for survival evolves to include a quest for love & friendship and the crushing disappointment of seeing casualties along the way makes this feel like a rollercoaster from the very beginning. The story is glorious and while there are a few sections that initially felt a bit word-heavy they’re a necessary part of punctuating just how important the arc is. While the story itself second to none the artwork takes it into a whole other league with a cartoony edge that keeps it energetic and an edge of fine art that just keeps you engaged & flipping the pages back & forward to just look at those visuals. The lighting is spot-on and process examples in the back of both books really drives home the amount of work that’s gone in to a style that invokes a definite sense of awe. Mac Smith has put together a book that is the complete package and a prime example of the work & skill that is poured into personal comic projects all around the world. Having been a fan of other projects where writing & art are handled by the same person I think this is the best example of how complete that can make a project feel. 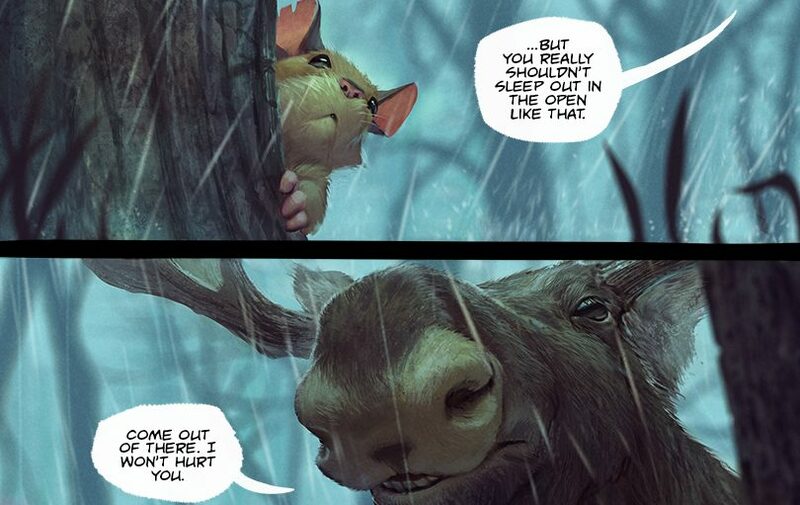 I love what I’m seeing as I read it, I love imagining what I’m going to see on the next page turn and a book like Scurry helps emphasize exactly why the comic world interests me and the scope of the quality that’s out there to be read, re-read & recommended. Beautiful, involving, moving & just perfect……..go read this as soon as you can and in whatever form you can. Get over to the Scurry website and the online shop to catch-up on the story so far and keep tabs on what else Mac is working on over on his Facebook & Twitter pages. 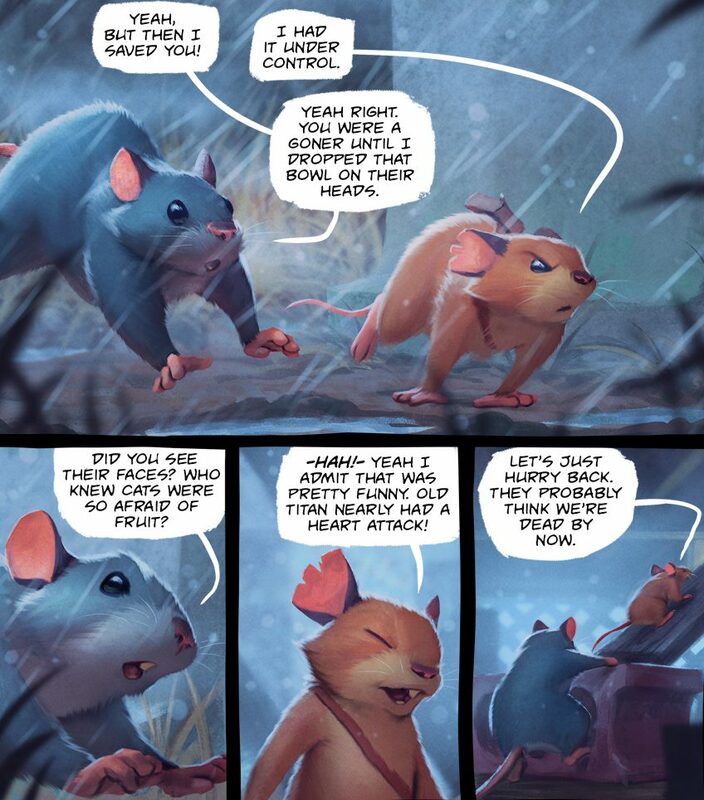 This entry was posted in Comic Reviews, Indie and tagged Kickstarter, Mac Smith, Scurry by G-Man. Bookmark the permalink.